Prior to the 1960’s the thinnest commercially successful mechanical pencil lead was 0.9mm. Thinner leads of sufficient customer acceptable strength were just not possible. Then in the 1960’s Pentel developed pencil leads using polymer rather than the traditional ceramic clay as the binding agent. Suddenly leads of 0.5mm and even thinner were possible, and the 0.5mm mechanical pencil as we know it today was born. Pentel have recently released their latest generation lead, Ain Stein. Now, I don’t read Japanese so I can’t really say exactly what Pentel claim about Stein, but as far as I can make out from Google Translate, it appears they have incorporated some silica like crystalline regularity into the structure of the lead, thus improving strength, smoothness and darkness. I’m not sure if silica is the main binding agent or if it’s a polymer and silica mix. Clearly a new product such as this immediately aroused my interest, and I was off on an internet shopping expedition. When I opened the parcel containing my first delivery of Ain Stein I was immediately struck by the sheer colourfulness of it all. It was a mighty pretty sight. To coincide with the release of Ain Stein, Pentel have also released a Limited Edition Graph 1000 x Stein PG1005S mechanical pencil. There is also an Ain Stein plastic eraser as well. It’s eye-candy. It really is. I can only apologise and say that my photographic ability and equipment is just not up to the task. The leads come in very nice plastic containers, with a bright colour scheme sweeping through the spectrum by lead hardness. 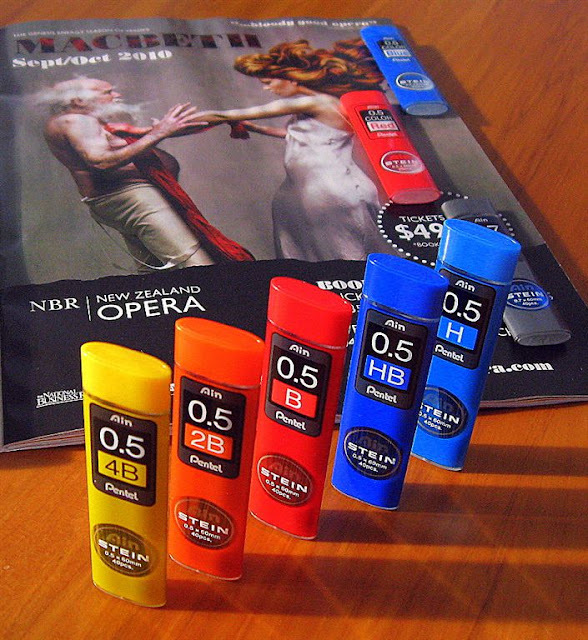 As at the time of writing, in 0.5mm the range is 4B through to 4H, including F and HB Hard and HB Soft as well as normal HB. There is also red and blue coloured lead. You twist the top of the container to uncover a small hole which the leads are dispensed through. The container is recyclable. Well, Ain Stein certainly has the style, but does it have the substance? Is it smoother, darker and/or stronger than good ole’ everyday Ain? 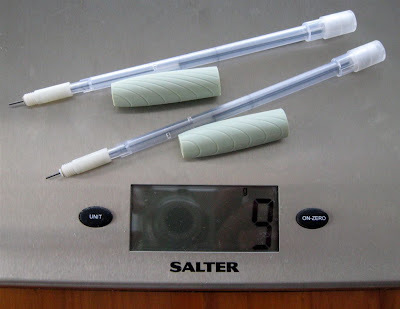 Time to put our size 0.5mm HB models to the test. No real difference. Both are quite smear resistant, although if you twisted my arm I might suggest that maybe Stein had a fraction more smear. Just maybe. Yet again, no difference that I can really tell. Pentel also seem to be claiming an improvement in smoothness. Well, here maybe for the first time I did notice some difference. Normal Ain is certainly a smooth lead, but Ain Stein did seem a fraction smoother. I did feel that little more of a glide over the paper. Finally then the strength test. My lovely assistant loaded my test pencils with Ain and Ain Stein so I didn’t know which was which and I proceeded to snap leads. Over and over. The end result was pretty conclusively inconclusive. I did at times think I noticed a difference in failure mode with Stein being a much cleaner sharper break versus normal Ain tending to crumble and break, but other times they seemed the same. Equally on those occassions when I thought one was stronger than the other it was usually Stein, but not always, and most often I didn't think there was any difference. So, I’m not going to dispute that the lead testers down in Pentel’s lab can show Stein as being stronger, but out in the real world I don’t think your average pencil pusher will notice much difference. So, final conclusion? Pentel apparently say Ain Stein has improved strength, smoothness, consistency and darkness. I can’t disagree, but overall I can’t really agree either. All of my tests here are very subjective, as is each users own experience with their mechanical pencil, lead, paper and writing style combination. I won’t therefore be surprised to see someone else disagree with my assessment of Ain Stein. 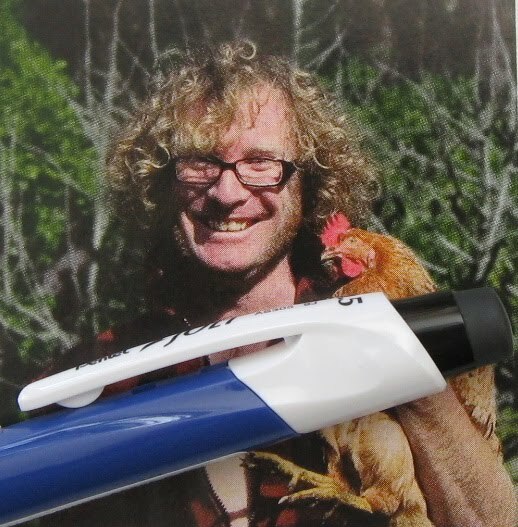 As I said, I’m sure the Pentel lead experts can tell the difference, just not ordinary folk like me. I've been trying to document the introduction of 0.5mm and other thin lead mechanical pencils. I've got about as far as I can go, so am publishing this draft in the hope some of you out there may be able to fill in some of the gaps. You can leave a comment or email me via the My Profile link in the sidebar. A Timeline of the Introduction of 0.5mm Mechanical Pencils and Other Related Stuff! 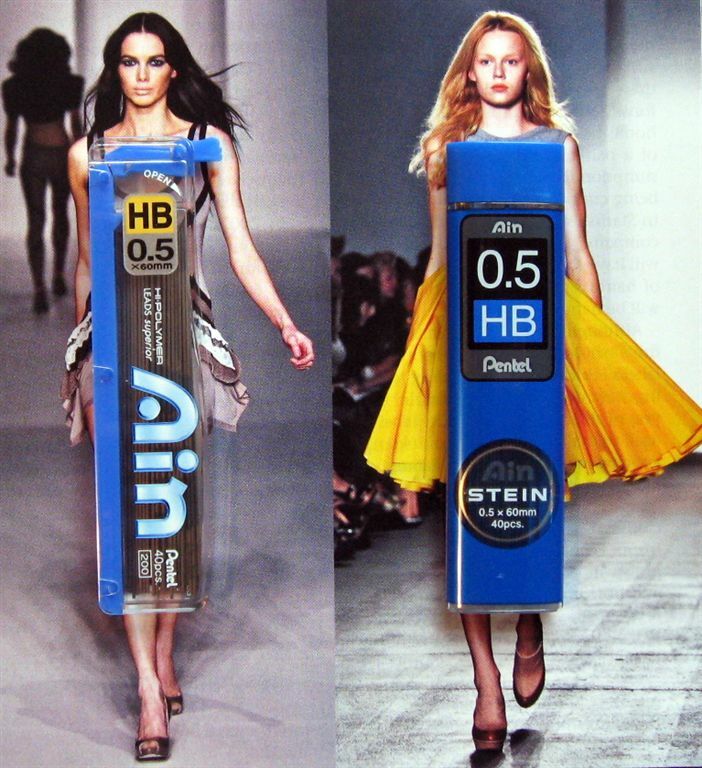 • Faber-Castell release the worlds second 0.5mm polymer lead, and their first 0.5mm pencil "A.W. Faber Castell TK 9501". • Staedtler release their first 0.5mm polymer lead and pencil "Micrograph 770"
• Chitose Kagaku Kogyo Co. Ltd (OEM lead manufacturer) founded by Sekiya Takashi, former Pentel employee and developer of their polymer leads. • The Japan Stationery Company Ltd changes its name to Pentel, which it had been using as a product brand name, and as a company name for some overseas subsidiaries. From now on 0.5mm continues to increase market share and by the mid-1980’s it dominates the mechanical pencil industry. For some illustration of the rise of thin lead mechanical pencils, here are some examples from some pencil catalogues. 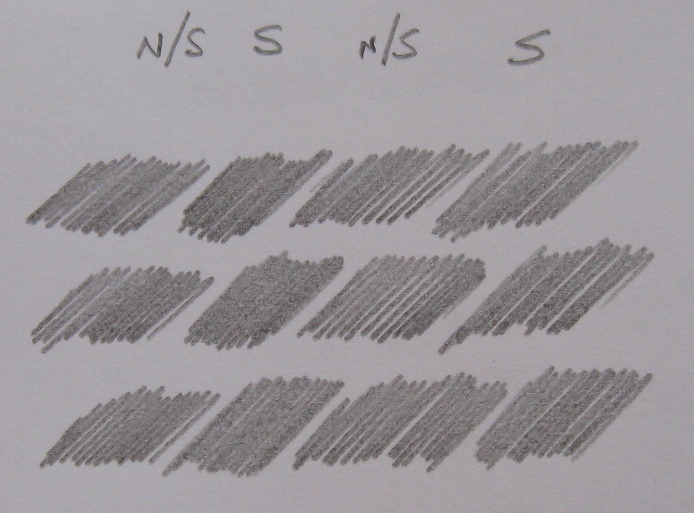 A simple measure of how many catalogue pages are devoted to traditional 2mm clutch pencil type leadholders compared to thin-lead mechanical pencils. 1969 Staedtler Mars Catalogue, English language. • Leadholders only, no MP. 1977 Staedtler Design Mars Group Catalogue, English language. Here’s one of Pentel’s newer additions to their range, the AS305 Jolt mechanical pencil. At the time of writing it is available as the AS305 0.5mm or AS307 0.7mm, each in four different colourways. 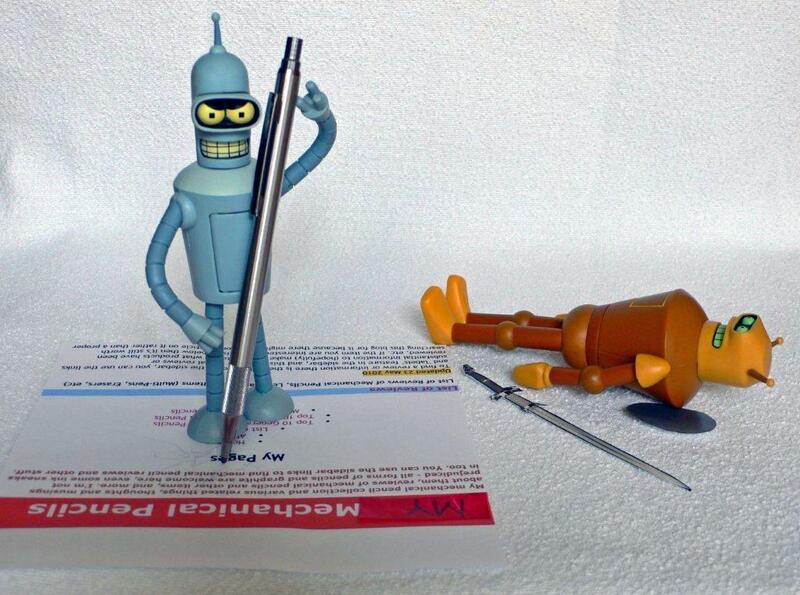 First off then the Jolt is a pretty interesting looking mechanical pencil, and I mean ‘interesting’ in a good way. I’ve got to admit that personally I much prefer the pink and orange colour options as they look so bright, cheery and fun. Then there is that clear window in the body. It’s reminiscent of some sort of reservoir level window in a pen so you can see how much ink you’ve got left. My first thought was that it would allow you to see how many leads you had inside the pencil, but I was wrong. The eraser is moulded and shaped to be an extension of the design lines of the pencil body. It’s not just the usual standard cylinder of eraser material chopped off to length and stuck in a hole. 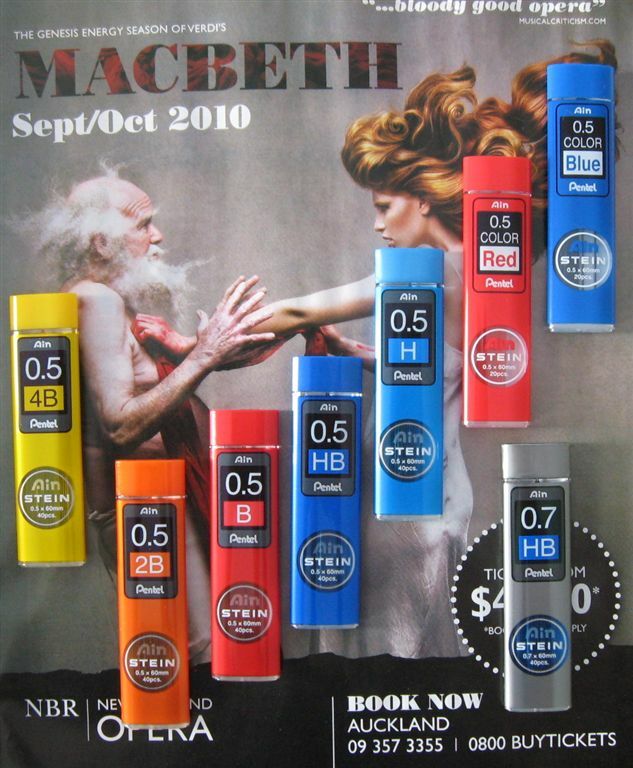 So, there’s no denying it, when it comes to aesthetic styling, Pentel have done some mighty fine work with the Jolt. This is a pencil of dramatic looks. In the hand, the Jolt is about what you would expect. A lightweight all plastic pencil with rubber grip. It looks and feels reasonably substantial given those parameters. The only slightly surprising thing is that the grip felt wider than it looked, if that makes sense? So anyway, what about that window? Like I said, my first thought was that it would let you see how many leads you had inside the lead chamber. Well, it doesn’t. Rather it lets you see the shaker weight that operates the lead advance mechanism when you give the Jolt a shake or two. The weight is actually a spring, and it’s even painted in a nice colour so it looks good in the window. I told you, there’s some serious attention to aesthetics here. So, this is a shaker mechanism pencil and the shaker weight is in the form of a spiral wound spring. Note the stretched ends of the spring which provide some impact cushioning when you shake the pencil. It’s very subjective, but I felt that the Jolt requires more of a shake to activate the lead advance than most other shaker pencils do. Things go best if you first extend the lead sleeve out of the tip by using the push top button before you start shaking away. 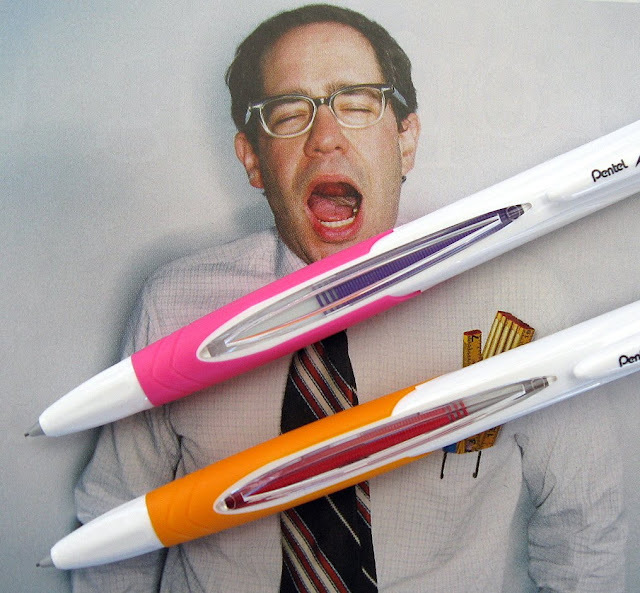 Pentel describe the Jolt as an automatic pencil with a shaker mechanism. I quote from their USA website, “Revolutionary Sliding Sleeve Technology automatically advances lead for uninterrupted use. Click pencil top to advance tip, then shake twice to expose lead.” Talk about marketing department exaggeration. “Revolutionary sliding sleeve technology” – hmmmm, that would actually be the normal everyday sliding sleeve that’s been on millions upon millions of mechanical pencils for decades. “Automatically advances the lead” – umm, no it doesn’t. The sleeve simply slides back a couple of millimetres to expose some more lead if you press it back. No lead is advanced, and after its retracted if you keep on writing you will have to manually operate the lead advance mechanism to advance some more lead. It is not an auto-advance mechanism at all. Pentels use of the word automatic to describe their mechanical pencils is quite confusing and somewhat misleading. I admit that they are just being historically consistent and continuing their tradition, as they originally used the term decades ago to mean that a new stick of lead from the lead chamber would automatically feed itself into the mechanism if you just kept clicking away. However these days when many mechanical pencils have auto-advance mechanisms, a lot of people get confused and think Pentel’s ‘automatic’ means auto-advance of the lead as you write and wear down the lead, particularly when Pentel state “Automatically advances the lead”. As well as the shaker mechanism, the Jolt is of course also a standard push top button ratchet mechanism. Ten activations of the mechanism – by clicking or shaking – will get you about 6mm of the 0.5mm lead. The lead sleeve is a short retractable cone, so the pencil is pocket safe. At the time of writing that nice looking eraser on the top of the Jolt is irreplaceable. Pentel state the eraser refill for the Jolt is their standard plain PDE-1 eraser refill. Garrrr!!! How boring! 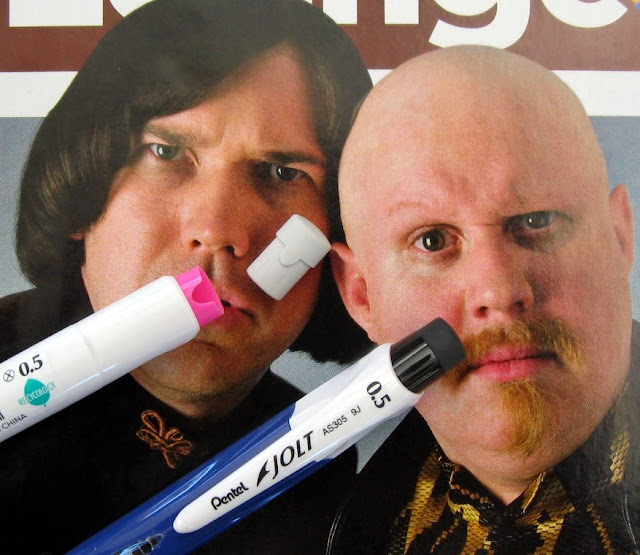 And talk about ruining the looks of your beautiful pencil. See above how the original moulded eraser even fits into a positioning slot cut into the eraser housing! I assure you the PDE-1 does not do that! Nor does if maintain the aesthetic contour of the body. As usual you remove the eraser to access the lead refill chamber. The pocket clip is an integrally moulded plastic clip, but quite strong and springy. Most importantly it is fitted to the main body such that it is sprung tight against the body. There is no annoying gap between clip and body like you get on many cheaper pencils. The grip zone is a moulded rubber section. It is round and generally smooth with only a couple of indented lines down low. The rubber compound is quite hard and not particularly grippy. So, the grip looks good, but…well you know I’m not a fan of rubber grips so let’s say no more. One problem I did have with the grip zone is that the clear window is raised slightly up out of the body, and it extends down low enough to sometimes interfere with my fingers when gripping the pencil. Markings on the pencil pocket-clip are ‘Pentel’, ‘Jolt’, ‘AS305’, a mould or some other such ‘production identifier number’ and ‘0.5’ for the lead size. The sticker on the main body states “Made In China”. Overall then, the Jolt AS305 mechanical pencil is a worthy addition to Pentels range, and to your pencil case. Best Points – Looks great. Love the shaker viewing window. Not So Good Points – The rubber grip is a bit of a let down, and the window interfering with the grip. No proper replacement eraser available. Dimensions – Length 143mm, diameter 11mm. Balance point about 75mm up from the tip. 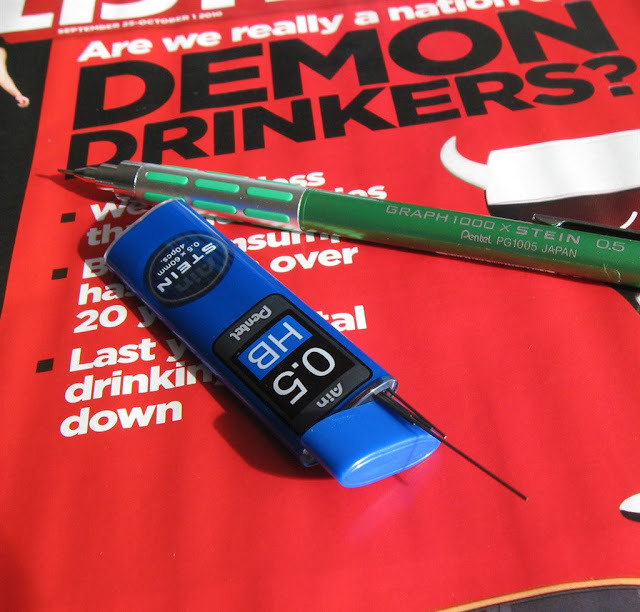 The Pentel Jolt mechanical pencils featured in this article were kindly sent to me as freebies by Cult Pens. I recently made contact with Mr Osamu Fukuoka, International Marketing Manager of Platinum Pen Company of Japan, and he agreed to answer a few questions about Platinum and their products. Dave - Platinum Pen aren’t particularly well known outside of Asia so some readers of this blog won’t be too familiar with your company. To start with, could you tell us a little about Platinum’s history? Osamu - Platinum Pen Co was established in 1919 as manufacturer of fountain pen. During 1930’s, Platinum started manufacturing Maki-e fountain pen. Maki-e is the Japanese traditional hand crafting. Also Platinum is the first company to adopt the fountain pen cartridge system. 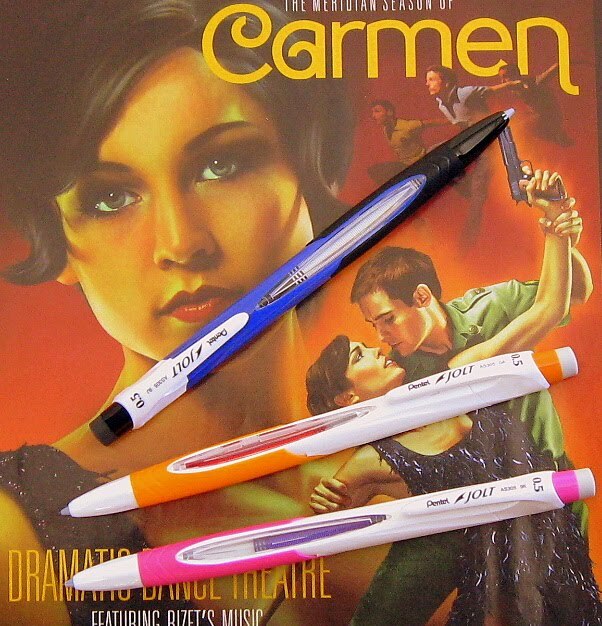 Mechanical pencils were added to range in 1935, multi-pens in 1978. Dave - And what about Platinum today? Osamu - Platinum main office is in Tokyo, Japan, and we have two factories in Japan. We also have the factory in Shanghai (China), Shenzhen (China), Taiwan and Ho Chi Minh City (Vietnam). Japan’s factory is making the middle-high end writing instruments; other factories (China, Taiwan, and Vietnam) are making the low writing instrument & OEM products. In Japan we have 250 persons, overseas factory staff total 400. 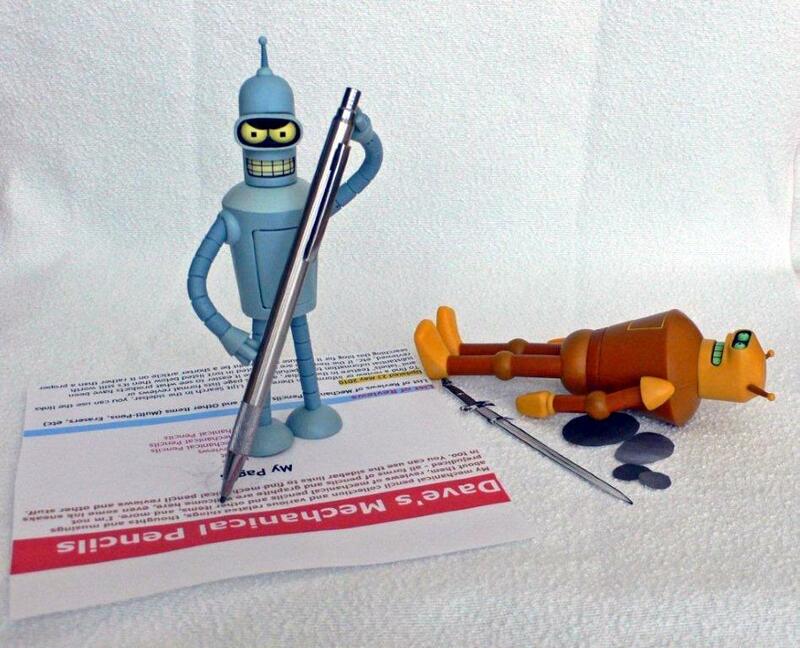 Dave – I note that compared to many writing instrument companies Platinum seem to have a large selection of multi pens. What is Platinum’s speciality, your strongest product group? 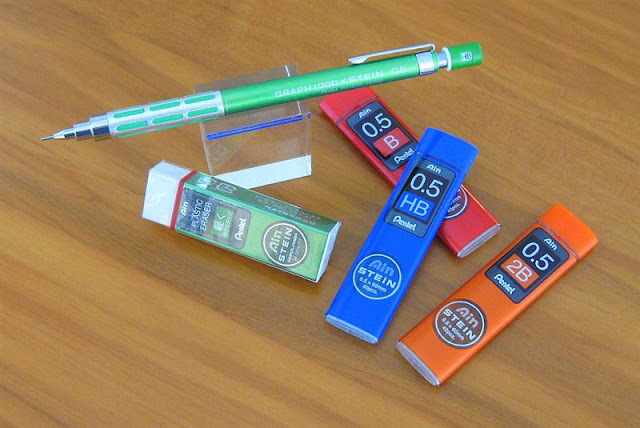 Osamu - Platinum’s main product is fountain pen and multi-function pen. We have good sales of multi function pen in Japan market. Best sale is 3 action multi pen - black & red ball pen with mechanical pencil. Market price JPY 1000 - 3000 model is good sales. There are lots of multi pen company in Japan. Platinum supply the standard multi pen, also we’re supplying the wood body, leather body, sterling silver body, modern maki-e multi pen etc. We have many multi function pen types, so for that reason we think that we are the leading brand of multi pen in Japan market. Dave - What sells more in Japan – technical drafting style pencils like the Pro-Use, or general writing style pencils like MOL-500 and A-Pen MAQ-1000? Osamu - Pencils like Pro-Use MSD series are suitable for drafting, however these item are specialised, our sales of general everyday writing pencils are better sales than MSD series. Our biggest selling model of pencil is MSIQ-200 series; they are using the soft silicon grip. Price is JPY200, reasonable price. 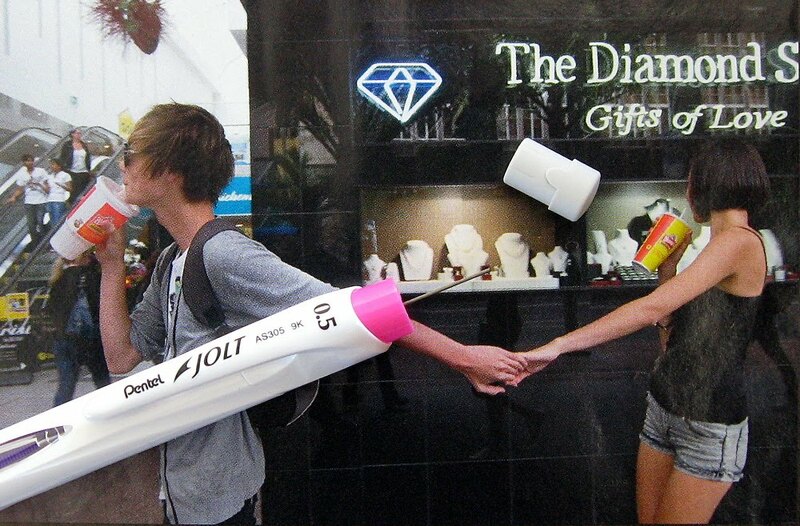 This model is good selling mechanical pencil in Japan market. 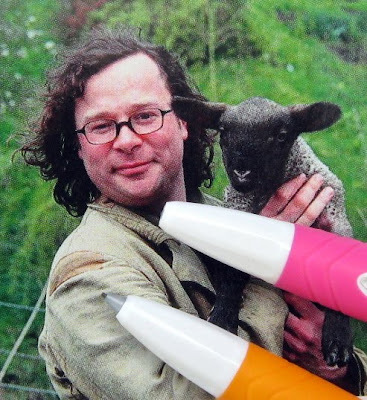 Dave – Can you give us some data on the sales ratio of pencils by lead size? Osamu - We don’t have many mechanical pencils, so our pencils are 90% 0.5mm. The pencil’s standard lead is 0.5mm in Japan market, most everyday writing pencil is 0.5mm. Other size 0.7mm and 0.9mm are not so popular in Japan. This is the same for fountain pen. For example, Japanese prefer fountain pen nib of Fine or Medium size. However European or American market prefer Medium or Broad nib. Dave - Which countries are your primary market? Osamu - Platinum’s biggest market is Japan. Our main export market is USA, Korea and Taiwan. USA and Korea’s main exporting products are fountain pen. In Taiwan main exporting items are fountain pen and middle class products. For our pencil sales, 90% is Japan market. USA, Korea & Taiwan are not big. Dave – Do you have plans to try and expand sales in Europe, America, etc? Osamu - Our next trying market should be Europe. We think that there is the custom to use the fountain pen in EU market, so we’re trying to expand sales in Europe market. Platinum main products are fountain pen or multi function pen. Last 20 years main item is multifunction pen instead of fountain pen. We would like to export the multi function pen to overseas market. However in USA or Europe market they are not so popular. We’re thinking how to promote the multi function pen in overseas market. Also regarding the pencils, we’ll try to promote them for overseas market. Dave – Thanks very much Osamu. I wish you luck with expanding the Platinum brand around the world. 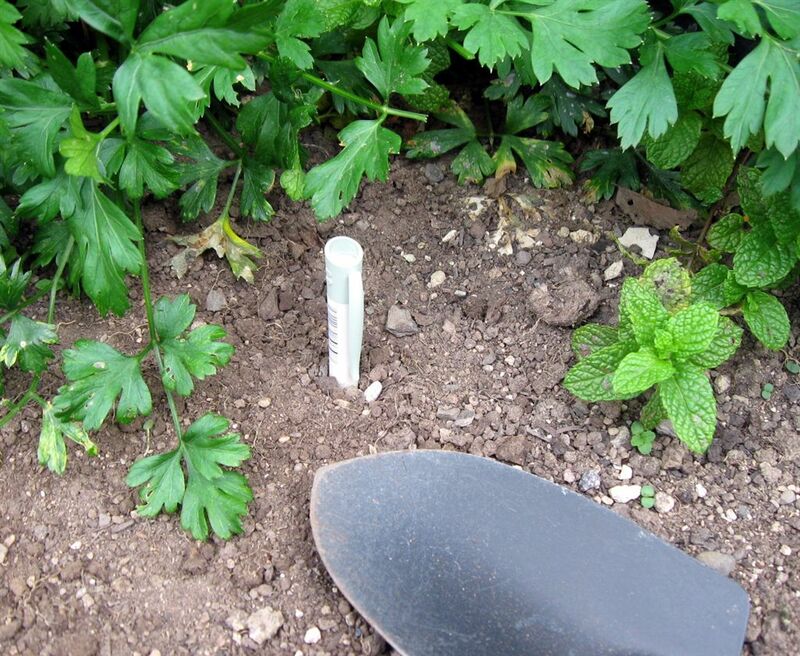 Sacrificed for the greater good, poor Papermate Biodegradable Mechanical Pencil lies in a shallow grave just outside my window, there between the mint and the parsley, his resting place marked only by a brother pencil, stuck half into the ground. Laid to rest in early May 2010, after six months I will exhume, examine, document, photograph, report and reinter, for another six months. Thus we shall witness for our very selves the circle of life, the miracle of biodegradability! 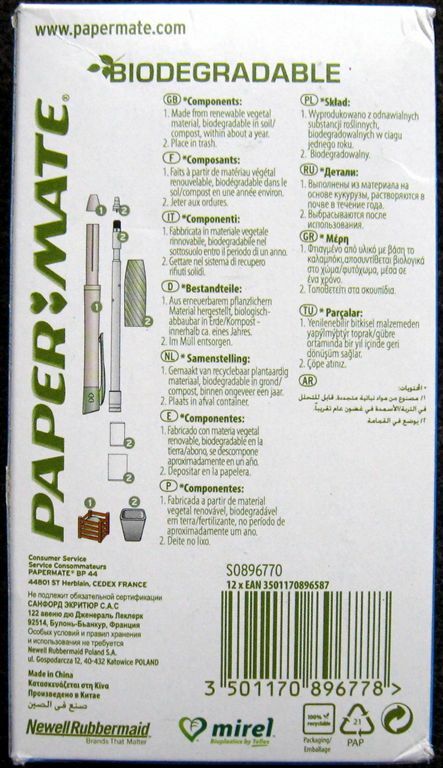 So then, exactly how much of the Papermate Biodegradable mechanical pencil is actually biodegradable? Well, as shown on the box, when you decide it’s time to compost your pencil you disassemble and separate it into two groups of components. Basically the grip and mechanism go in the rubbish bin and the main body is the biodegradable part. Here they are separated and ready for experimentation down in the lab. 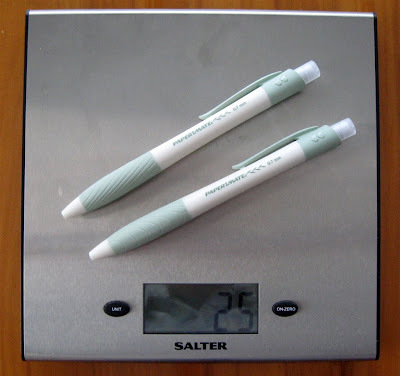 According to my scales, 2 mechanical pencils weigh 25 grams, and the non-biodegradable parts weigh 9 grams, so that means 16 out of 25 grams or around about 2/3rds of the pencil by weight is biodegradable. So, we shall see whats left after 6 months, in early November. 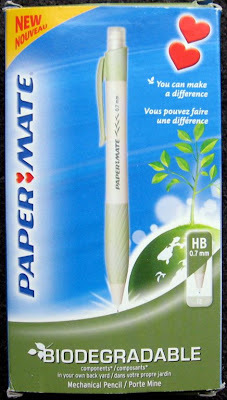 Here's a link to my review of the Papermate Biodegradable mechanical pencil. 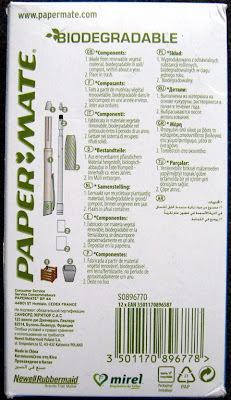 As noted in the review, these Papermate Biodegradables were donated by office supplies specialist Euroffice. Just a quick bit of information re Lijit over there in the sidebar. I added the Lijit search function to this blog a bit over a year ago and find it very useful, and highly recommend it to any other bloggers out there. I have recently enabled a couple of other features on it. They’re not new, it’s just I’ve never previously enabled them. So, the “Surprise Me” button will now take you to a random article in this blog. The “Explore” button will give you a diagrammatic view of blogs that are fans of this blog, friends of this blog and blogs followed by this blog. You can then click on any of them to create their diagram, etc etc. It’s not totally accurate, but kind of interesting. Anyway, just thought I’d draw it to your attention. The Revolutionary Blood still pumps. A little while ago Max from Copenhagen sent in a guest review of his latest mechanical pencil purchase. So, I’ll now hand over to Max. I’ve just recently bought the fairly new Staedtler 760. (Mine is a 0.7 mm). The pencil is very light, a little too light for my liking. The body is made of a shiny blue plastic. This makes it look better from a distance than up close. The transitions between materials are actually nicely made despite the triangular shape. The pocket clip may look a little cheapish from a distance – like the clips on cheap ball pens. But examining it a little closer reveals that it is actually of quite good quality. It is a push top mechanism with a twist operated eraser as on the Paper Mate PhD and the Faber–Castell Grip Plus. The eraser itself is quite thin but does a decent job. There is no description of how to fill the pencil with leads, so you need to figure out for yourself just to pull the top off with a firm grip. The benefit of is that the ratchet is held firmly in place. It was a pleasant surprise to learn that it holds a lot of spare leads – actually on par with the Lamy 2000. The push mechanism is pleasantly smooth and without noise. Ten clicks will give you about 9 mm of lead. The pencil is completely pocket- safe. The tip supporting the lead stays firmly in place while writing without being locked. It only takes a light push to retract it after writing while pushing the top button down. What is the Staedtler 760 like to write with? This is where it is actually a bit of a surprise! It is light, triangular and with a rubber grip. It has everything against it! But it is actually a very pleasant performer with good balance (approx. 40/60 weight distribution, being bottom heavy). But but but…after a while the rubber will start to loosen a little and the edge of the rubber grip is felt against the finger tips. This will never become one of my favourite pencils. It just lacks the quality feel of my favourite pencils. But it is a good pencil for carrying at work. I do find it a bit pricey. You will get three Rotring Tikky 3 for the same price or almost a Lamy Safari which is far superior. A number of readers are contacting me to enquire about my wellbeing after the Christchurch earthquake. So, firstly thanks for your concern. Luckily for me personally I and my immediate family and friends are all a long way away from the quake zone and are thus all unaffected. Obviously though a different story for those who live in the zone or were otherwise affected by the quake, and my thoughts are with them. For a 7.1 quake the damage and casualties appear astonishingly light which is good fortune and I guess a testament to our earthquake construction code. 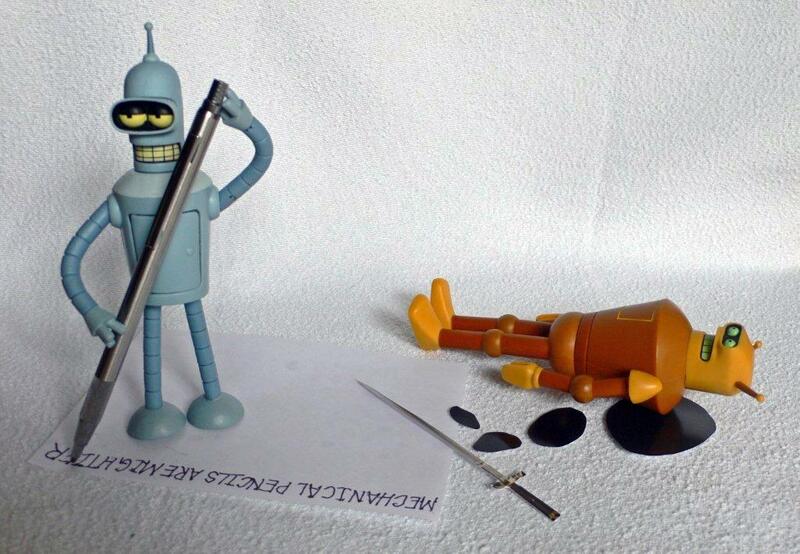 Some say “The pen is mightier”…but they are just wrong! Oi! What's your game Bender? 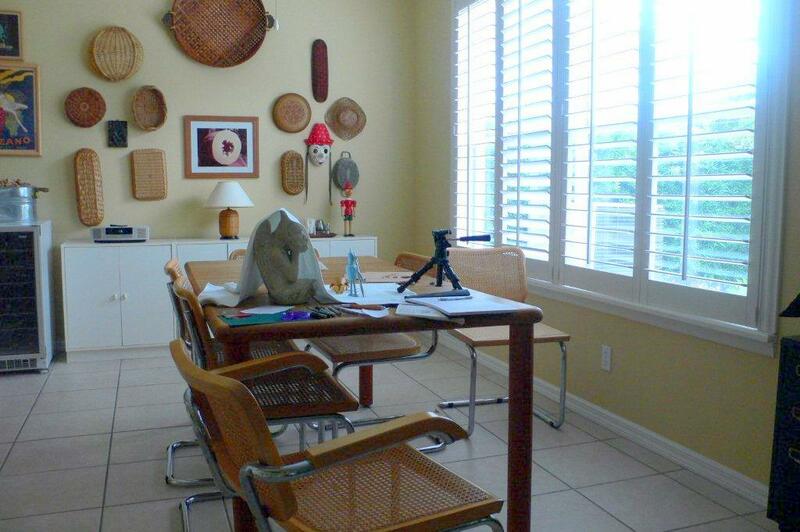 All photos courtesy of Florida Bob.